Yesterday’s Hebrew date, Kislev 7 was the “birthday” of Chabad of Louisiana. On that day in 1975 my parents, Rabbi Zelig & Bluma Rivkin, arrived, with 2 year old me and my one year old brother Yochanan in tow. Their goal was to be the Rebbe’s ambassadors to the city and region, in strengthening Judaism and Jewish commitment in any way possible. How does a young family just show up in a place to which they have no familial association or any connection at all, and expect to be successful in establishing a Chabad presence that would have an impact on the community? My parents were privileged to have several private audiences (called Yechidus) with the Rebbe in the years leading up to their move to New Orleans. During those meetings the Rebbe gave them guidance and direction with respect to their own lives as well as their responsibility to others. Among the things that my father shared with me was that the Rebbe assured them that “if you will make it bright and warm for others, then Hashem will bless you with brightness and warmth in your own lives.” This is the type of empowering blessings and guidance with which the Rebbe dispatched his Shluchim to locations all around the world. Interestingly, while my parents would go on to have several more children after moving to New Orleans, the only two that settled in New Orleans as adults are the two of us. (My sister Mushka came back to Louisiana, but in Baton Rouge.) Looking back that seemingly casual statement of the Rebbe turned out to be quite prescient. 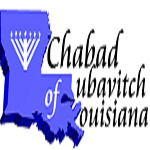 So happy birthday Chabad of Louisiana. We have come a long way since that day in 1975. We have partnered with this amazing community to achieve a lot together. There is still more work to do and we are eager to continue until the coming of Moshiach very soon.